When she was a child, Megan commandeered scrap paper and markers to create family “newspapers.” She learned to read at age 3 by reading out loud from the T.V. Guide. When a relative wasn’t convinced, she was handed pages from the New York Times to read. Her family is still trying to figure out where she gets her writing ability from. Megan is a 2002 graduate of the University of Alabama, where she was a member of the Million Dollar Band and served on staff at the Crimson White. Upon graduation, she embarked on a newspaper career that took her from Alabama to the border of Tennessee and Virginia, up to Maine, across the country to Arizona and back east to Pennsylvania. To date, Megan has received a number of journalism honors including six Awards of Excellence from the Society of News Design. 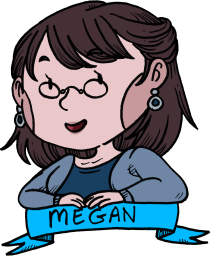 Megan is a designer for The Patriot-News and freelance blogger who currently lives in (the real) Mechanicsburg, Pennsylvania, with her three cats and many books – and has yet to find any malicious clanks lurking in the apartment. She is married to a Scouser who is currently finishing his Ph.D at Liverpool John Moores University. She is constantly plagued by plotbunnies.